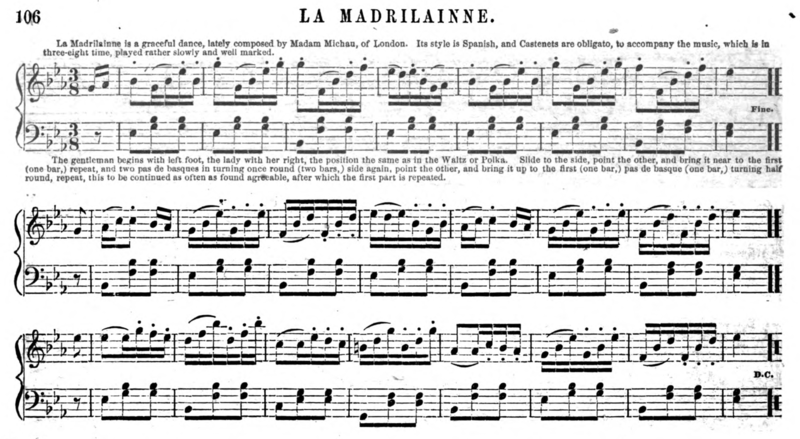 La Madrilainne is an elegant variation of the Redowa, composed by Madame Michau of London in the mid-19th century. The dance is said to be of Spanish style ("castanets are obligato"). Given that the adjective from of Madrid is madrileño/a, that's probably the origin of the name. 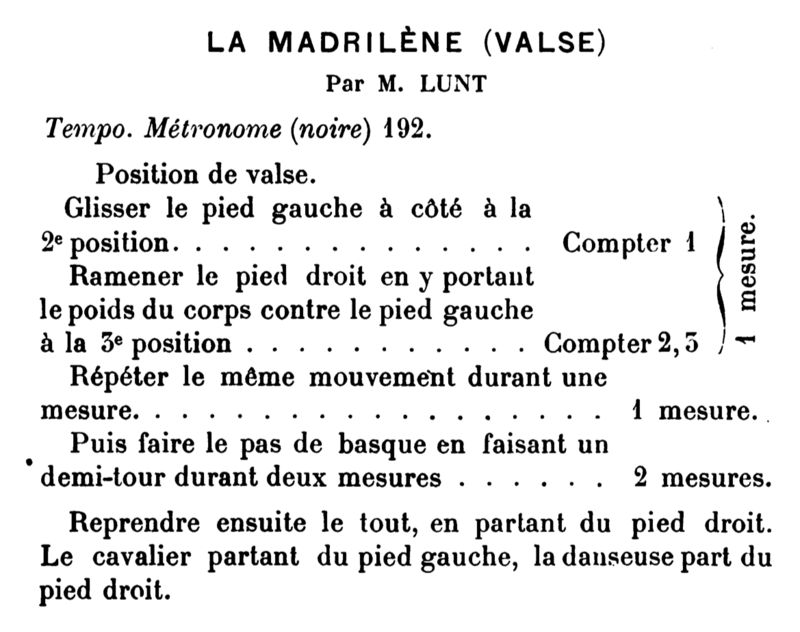 Slide leading foot to the side (1), and hold, leaving the the trailing foot pointed to the side (2), then close the trailing foot to the leading one (3). Repeat (4, 6). 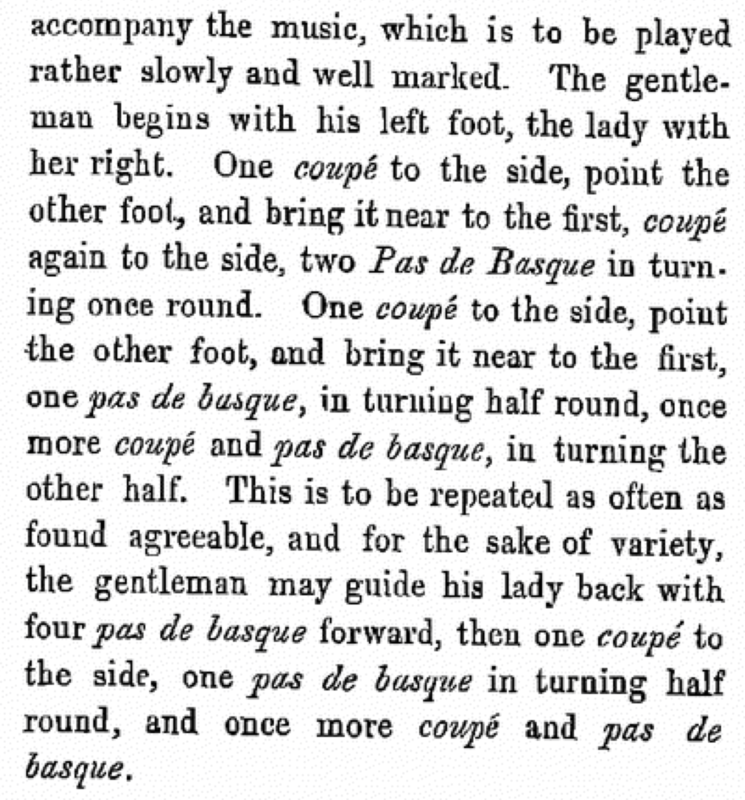 Turn once around with two pas de basques, i.e., dance one full turn of Redowa (1, 2, 3, 4, 5, 6). Follow this by one slide-close and a half-turning pas de basque (i.e., a half redowa) (1, 3, 4, 5, 6), then repeat that opposite (1, 3, 4, 5, 6) to complete the turn and start again from the beginning. 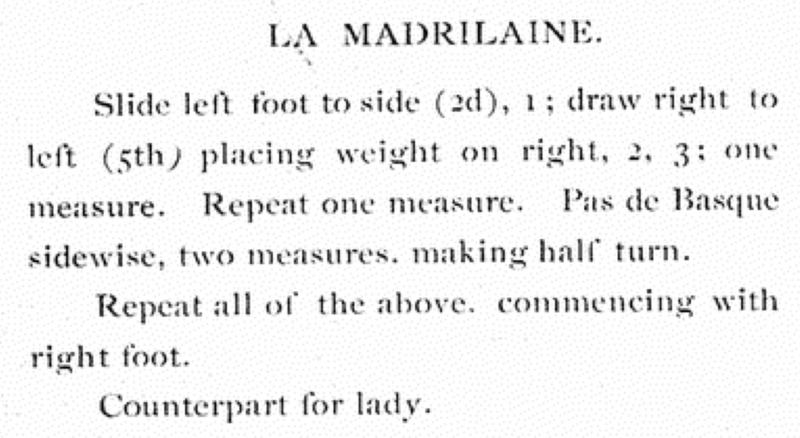 Each half can "be continued as often as found agreeable," i.e., it doesn't always need to be 2+2+1+1+1+1. Music in 3/8 (or 3/4) time, played "rather slowly and well-marked." 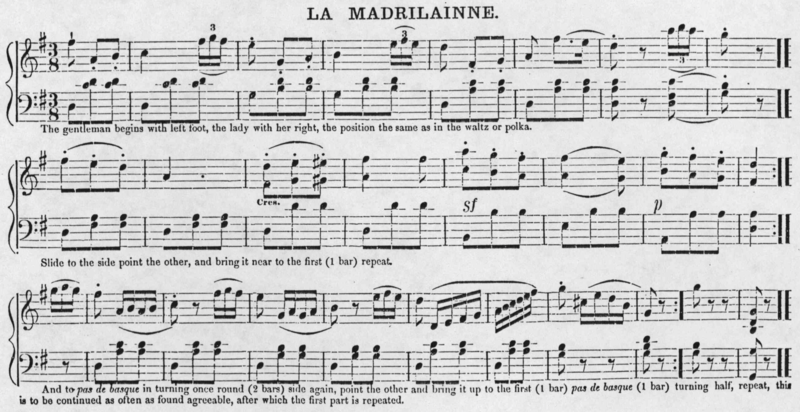 Howe 1859 and 1868 provide music specifically for the dance. EH59 — Elias Howe. (1859). Howe's Drawing Room Dances. Boston. EC60 — [Eugène] Coulon. (c. 1860). 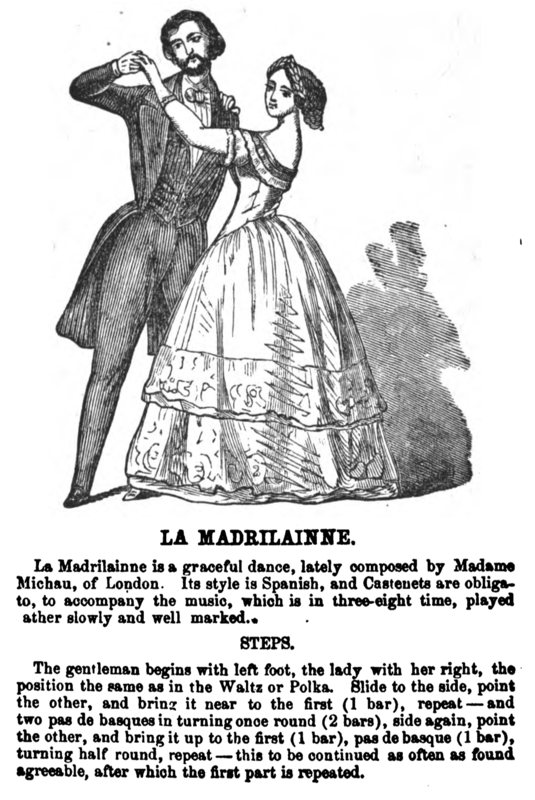 Coulon's Hand-Book, Containing All the Last New and Fashionable Dances (Third Edition). London. WL03 — Washington Lopp. 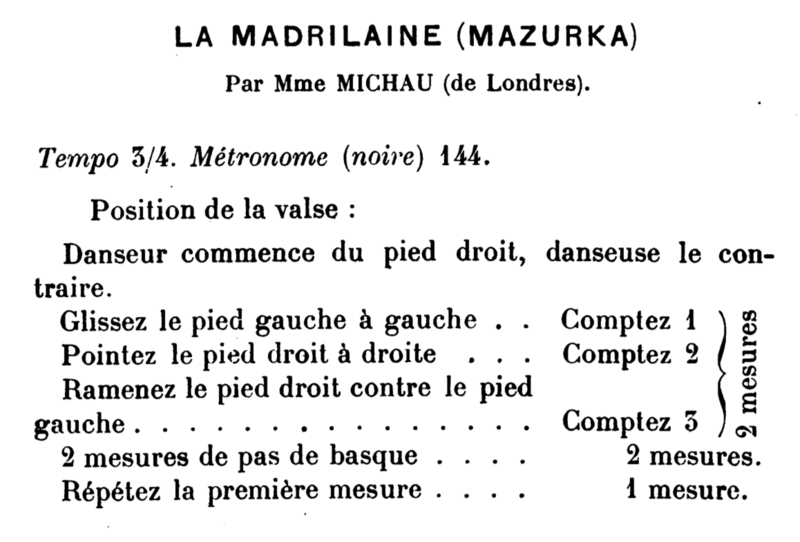 (1903). 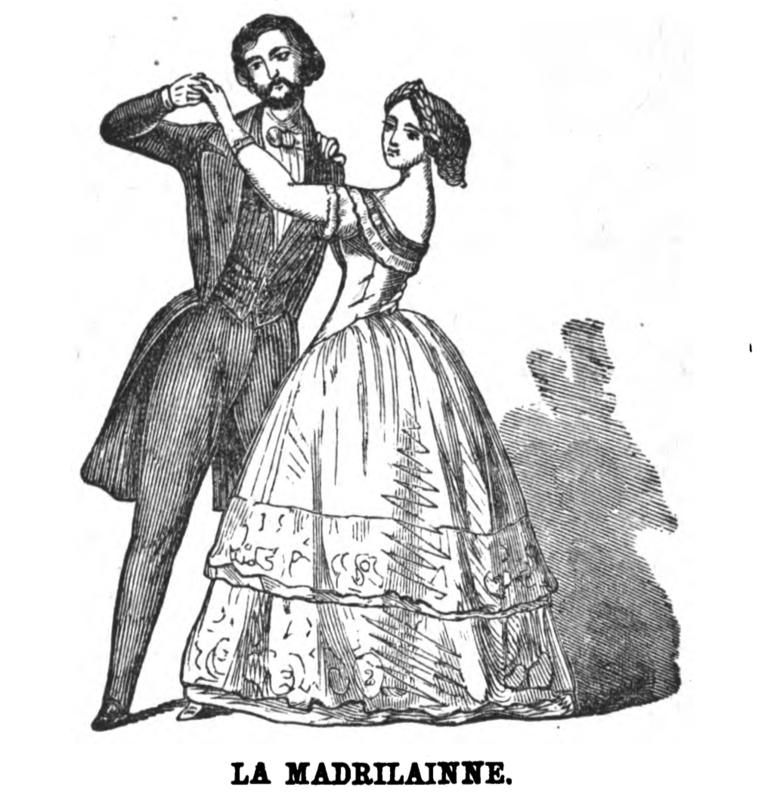 La Danse. Paris.